This post is WAY overdue (apologies). We hosted our 3rd Lamb Jam and served up hearty (but healthy!) 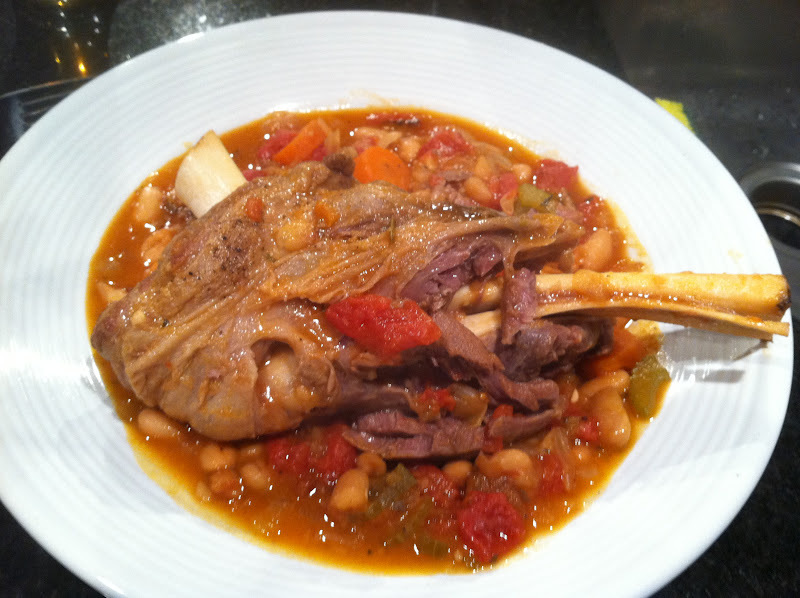 braised lamb shanks with white beans and tomatoes. This recipe is full of great vegetables and of course, lean and tender lamb. It is really easy to make for a crowd because this is one of those one-pot-wonders. After your veggies are prepped, everything stays in one pot, keeping your counters clean and yourself free to entertain guests. **Note: We've adjusted the directions for cooking in a large pot over the stove because we do not own a Dutch oven -- still came out great! 1. Heat olive oil in a large post over medium-high heat. Season lamb shanks with salt and pepper and brown lamb shanks on each side in the pot. Remove the shanks from the pot and set aside. 2. Add onion, carrot, celery, tomato paste, herbs de Provence, garlic, and a pinch of salt and pepper to the pot. Cook for approximately 5 minutes. 3. Add the wine to the pot of vegetables and be sure to scrape the brown bits from the bottom of the pan. 4. Add broth, beans and tomatoes to the pot and bring to a simmer. 5. Add the lamb shanks back into the pot, making sure to nestle each shank among the vegetables. 6. Cover the pot and cook for 1.5 - 2.5 hours, until the meat is fall-off-the-bone tender. 7. Spoon vegetable mixture into a bowl, and top with a lamb shank.